It’s 2019, and school safety has catapulted as one of the top priorities for school districts around the country. 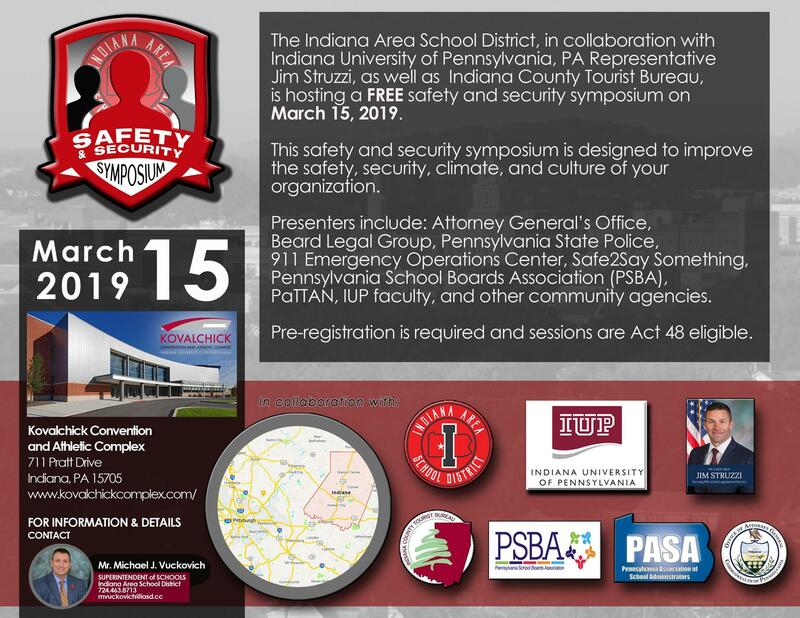 With an eye toward providing educators with various resources and opportunities specific to Pennsylvania, the Indiana Area School District -- in collaboration with Indiana University of Pennsylvania, PA Representative Jim Struzzi, and as well as Indiana County Tourist Bureau-- is hosting a FREE safety and security symposium on March 15, 2019. This safety and security exchange will provide information that benefits all stakeholders in your education community: administrators, board members, and staff members alike. Presenters offer valuable resources to help prepare your organization to continue the discussion on safety and security in our schools. Pre-registration is required, and you will be invited to choose the breakout sessions that you feel will have the most impact in your professional learning on these various topics, as well as overall impact on your District’s systems of operations. Please take time to review the various course breakout sessions and their descriptions. Don’t miss this opportunity to connect and learn. Participants attending the Safety Symposium on March 15, 2019, will have the option to select a maximum of 4 breakout sessions to attend on this day. Prior to the breakout sessions, attendees will hear opening remarks from former Secretary of Education - Dr. Gerald Zahorchak. We want to empower the attendees to exercise their voice and choice in planning their day! Please review the various break out session descriptions by clicking on the "Session Descriptions" on the right-hand side of this page. On that page, you will be able to review the sessions offered that day and register for the symposium. Click here to review instructions on how to register. Check out the PDF brochure for the Indiana Area School District Safety Symposium below.